The following article by David Batch describes the HOn3.5 layout, Dagabar, with particualr emphasis on the signalling system. 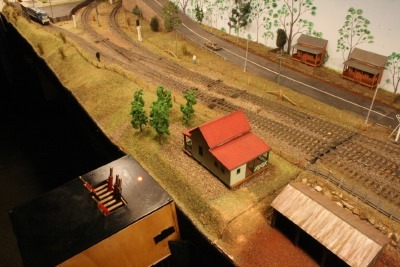 Dagabar won the MODRATEC Signalling Prize at the 2009, 2011 and 2012 Brisbane Model Train Shows. © The content of this article copyright 2011 David Batch. Send email for David Batch via MODRATEC. 2304 & 2311 leaving the coal loader. The track in the middle of the photo is the main line passing the grain silos as it enters the fiddle yard. We wanted a layout that depicted typical QR operation at a country station with full and empty coal trains and freight trains crossing at the station. Oakey Station looked like a good one to model as it had a Station, crossing loops and a large goods/storage yard. While it looked good to model, the layout would have to have been at least twice the size we wanted. The size of the layout was determined by what would fit into the trailer. As a compromise we designed a layout that had a station with a crossing loop, 2 small sidings for shunting and a branch off each end of the station. 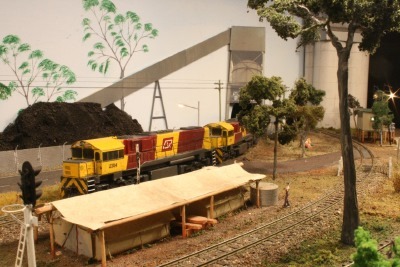 At Macalister, about 25kms west of Dalby there is a coal loader and we decided to hide the western branch as it goes into the fiddle yard with a model of the loader, in fact it is actually a photo of the loader and gives a place for empty coal trains to run to and full ones to come from. At this end the main line enters the fiddle yard by passing between the loader and grain silos. At the eastern end both the main and branch lines disappear under a highway flyover. 2304 with headlights on as it leaves the fiddle yard under the coal loader. 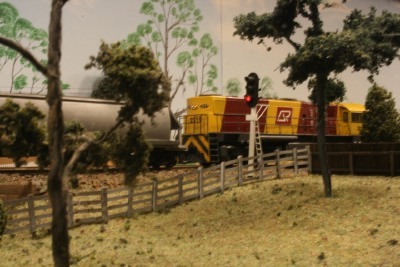 The way the branches are set up allows an empty coal train to go under the loader to a storage track behind the backboard. 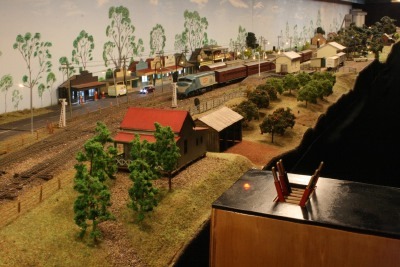 On the adjacent track is a full coal train that then comes out under the loader slowly as if it was being loaded with coal, through the station loop and on to the main line and proceeds around through the fiddle yard back to the front through the station and disappear on the other branch back to where it started. When we want to run the next coal train the empty one does the reverse of the full one and back under the loader ready for the next full train. In between these coal movements freight trains also run and cross in the station. 1501 in QR Blue and White colours waits at a red signal for the empty coal train to clear the points. QR practice is right hand running through loops on single track main lines, and when we decided that we should have signals we chose to use 3 colour aspect LED signals and use Green for Main Line and Amber for Branch line or left hand track through the station. There are 10 signals on DAGABAR and are set to green or amber as points are set and they return to red as the train goes over Infra Red Sensors in between the rails just past each signal. How best to control the signals was the next thing to decide. I knew that LEDs could be controlled by ICs but how and which ICs was a mystery. Research on the internet led me to a site called How Stuff Works, where there is a section on electronic gates. After reading the downloaded pages it looked the right way to go. Next step was to purchase the few components listed in the article and experiment. After setting up on the workbench red, amber and green LEDs as the signals and a couple of switches as the auxiliary switches in the point motors, and experimenting with them I soon realised that this was the way to go. 2311 approaches a green signal on its way to the coal loader. Without going into full details here, the basic operation of our signals is as follows. Route selection is by diode matrix with the auxiliary switches on the point motors used to send signals to the ICs. This then sets a signal to green or amber depending on which route is set. As the layout is single track main line, we have 3 up tracks and 3 down tracks in the fiddle yard along with 1 up and 1 down for the coal branch. When an up track is selected, a contact on a latching relay sends a signal to the ICs so only the up signals are set and the down signals are at red. After a loco has passed a signal, the Infra Red Sensor sets the latching relay back to its normal setting and the signal will revert to red. 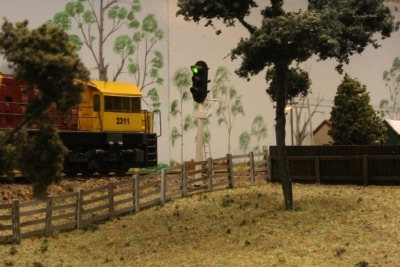 Even if the train is going continuously around the layout, the route selection button must be pressed again for the signal to change back to green or amber or the train will go through a red. Just like the real thing, red signals on DAGABAR do not stop the train. That is up to the train driver. The signal changes to red as 2311 passes it. The reference to the signal sent to ICs above is the voltage applied to the inputs of the ICs. This is zero volts for one state and 5 volts for the other. Full working of the ICs is explained in the How Stuff Works website. This is a very brief description of the signalling on DAGABAR. Some will no doubt say that this is not the best way to operate the signals, but it works for us. If you don't have signals on your layout, we suggest that you do install operating signals as they add so much to the overall appearance of a layout. Even if you know nothing about electronics, look up the links below, download the pages and do the experiments in the download. The ICs will not only control LEDs but will also control small relays known as reed type relays, which in turn can be used to work larger relays if necessary to work semaphore signals if that is what you have on your layout. The Infra Red Sensors we use are from 'Radio Train Electronics' in Melbourne. All of the points on DAGABAR are controlled from the control panel by diode matrix. The two points for the short sidings at the station are also controlled from a MODRATEC 6 lever mechanically interlocked frame located on the front of the layout adjacent to the points. The frame uses micro switches activated by the levers to control the points. A toggle switch on the control panel supplies power to the frame . This was done so that at train shows when the frame is not being used and a member of the public pulls a lever it has no effect on train operation as no points will change. The 6 levers are used to set the up and down mainline signals to red, change the two points and set the ground signal on each siding to green when it is clear for the train to leave the siding. 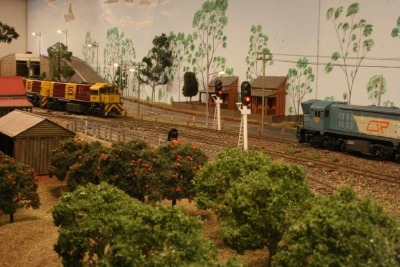 A view of the Town and station area with 1255 heading a set of Evans wooden cars. In the top right of the photo can be seen the coal loader and grail silos. In the foreground is the MODRATEC 6 lever frame. A new smaller box to contain the frame is to be made and a track diagram of the area controlled by the frame applied. I have been fascinated by the way mechanical interlocking works after I saw a railway film many years ago that had the workings of a mechanical interlocked signal cabin in it. Although it is only a 6 lever interlock I enjoyed building it from the parts supplied by MODRATEC. I have even thought about converting all of the station area to mechanical interlocking. Another view of the lever frame. The two points in the foreground are those controlled by the lever frame. One of the latest additions to DAGABAR was the placement of power poles and power lines on the poles and to the buildings. A problem with this was the power lines over the joins in the modules, and we have to remove the lines from one pole at each join. As the photos in this article were taken prior to the modules being separated for transporting to an exhibition, in some photos the wires can be seen on the ground. During this article, I have referred to 'we' and haven't told where the name DAGABAR comes from. First the 'we' is 5 modellers of Queensland Railways and DAGABAR is made up of our first initial of each modeller with a couple of 'A's added to make the name. Our names are David, Andrew, Graham, and Bruce and Robert. Thanks to Graham who came up with the name. It is now six years since we first exhibited DAGABAR and although we change or add something on it each year it has just about reached its Use By Date so this year, 2011, or next will be the last outing for it. It has given the five of us many happy times and many headaches, but we have enjoyed it. I hope this makes some sort of sense to you and inspires you add working signals to you own layout if you don't already have them.